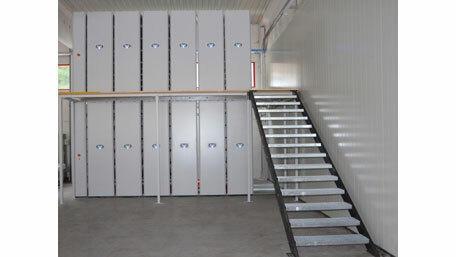 Called FOREG T2 and developed to offer maximum storage capacity using the least possible floor space, the electronically controlled system which can be operated from either upper or lower tier is supplied complete with its own flooring and access staircase. Shelving stacks at both upper and lower levels are configured so that they always move together; the rails on which the upper mobile units run being mounted on top of the lower stacks. Electronic operation obviates physical effort in moving shelving and every aspect of user safety has been built into the control system. With a wide range of accessories which include not only shelves but pigeon hole dividers, drawers, filing frames, hanging rails and sliding doors, the FOREG T2 system is ideally suited to archives and warehouses and to any location where high density storage is required. Together with its high quality systems, Ecospace provides a comprehensive range of services including surveys to determine the amount of storage needed, layout design and planning and installation.